Follow me on my pizza adventures around Northeastern Pennsylvania in my quest to find the ultimate pizza experience! NEPA is renowned for it's abundant and diverse selection of pizza restaurants including the renowned Old Forge style trays of pizza made in the "Pizza Capital of the World." I'm a lifelong NEPA resident, longtime pizza maker, and avid lover of all types of pizza. My goal is to bring you honest and comprehensive reviews of the amazing pizzerias we have in the 570. I'm a staunch small business supporter who loves to bring exposure to local pizzerias and help put them on the map. To learn more about the NEPA Pizza Review, check out my Frequently Asked Questions! If you are a restaurant owner who would like to put your pizza to the test and invite me in for a review, please email me at the address above and we can arrange a visit. It is great publicity! A list of some of my media appearances and publishing over the years! Froggy 101 - Who Has the Best Pizza in NEPA? (3/16/17) - Radio interview with Doc and Jessie talking pizza! Where to Eat Pizza - The Expert Guide to the Best Pizza Places in the World (2016). Organized a team of foodies and published in book listing NEPA Pizzerias among the best in the world! Fredi the Pizza Man Podcast (2016) - guest on the Fredi the Pizza Man radio show - multiple appearances. PA Live! - Blog of the Week (7/20/15) - Selected as blog of the week. PizzaSpotz - Great Pizza Blogs (2014) - NEPA Pizza Review featured on PizzaSpotz.com. 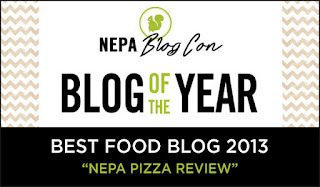 NEPA Blog Con - Food Blog of the Year (2013) - Voted as the #1 food blog in NEPA!